València is a charming old city and the capital of the Valencian Autonomous Community of Spain that is well worth a visit. It is the third Spanish city in terms of importance and population, and the 15th in the European Union, with 810,064 inhabitants in the city proper and 1,832,270 in the Metropolitan Area (INE 2008). It is on the Mediterranean Sea approximately four hours to the south of Barcelona and three hours to the east of Madrid. 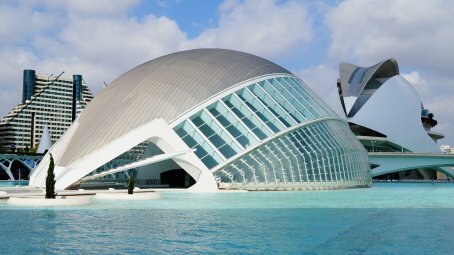 Valencia is famous for its Fallas Festival in March, for being the birthplace of paella, for hosting the "2007 and 2010 America's Cup", and for the massive architectural project by Santiago Calatrava called The City of Arts and Sciences. The river Turia run through the center of the city, but it was redirected a while back and replaced by a beautiful park. This is a very nice place to spend any free time you have in the city on a sunny day.